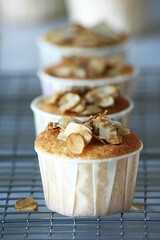 I made these ricotta raspberry almond cupcakes for “ladies night”. My aunt was having a bunch of overnight guests and I wanted to make an adult-tasting dessert that matched the Italianesque meal of roasted chicken. I also wanted the cupcakes to be fun, as I knew we wouldn’t be digging into them until after many martinis. If I was feeling especially ambitious, which I wasn’t because I was out all day and got home kind of late, I would have made homemade almond paste and homemade ricotta cheese. I would expect that substituting homemade ingredients would provide a more delicate outcome. I love almond tasting desserts… YUMMY! Your cup cakes look fantastic! 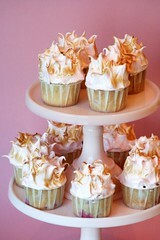 I also like the ice cream cone cup cakes from the post below…I’v got to try that :) You’ve got such a charming blog! Wow! Those look so festive. I can’t stop reading your site, even thought I can’t eat gluten or the photos. No matter–it’s just fun to watch your passion on these pages. Hay PuppyChulo – actually, my husband was talking about some burnt butter almond thing his grandmother used to make. That was my initial inspiration, that and italian ricotta cake. Shauna – That is the irony of all this, isn’t it… we can’t share each others creations! I am always inspired by your blog however. And I guess that’s the real point. Chockylit–Can’t imagine how wonderful these must have tasted…almonds and ricotta and raspberries…oh my. Yes! Hi Chockylit – I fell in love with your beautiful cupcakes, such a wonderful site! Your pictures are really gorgeous too. I’m sure you’ve been asked this before, but where do you get those lovely paper moulds? I bet I can’t get them here in the UK… Keep up the great work. Fancy! Wow these look absolutely amazing and so impressive. I feel like cupcakes tend to be an underestimated dessert, reserved for childrens’ birthday parties but you absolutely prove that sentiment false with your cupcakes! Unique Dessert Recipes are hard to come by. I work with Better Recipes and I have to say you have some really creative ideas here! I can’t wait to make these for my daughter’s baby shower! 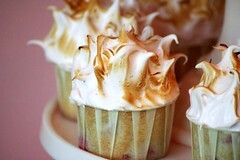 I’m planning on making these tomorrow for an after work party. Do you think the meringue will hold up all day in the fridge or will it get melty and runny? They look great, but I wouldn’t want to show up to the party with soggy cupcakes!